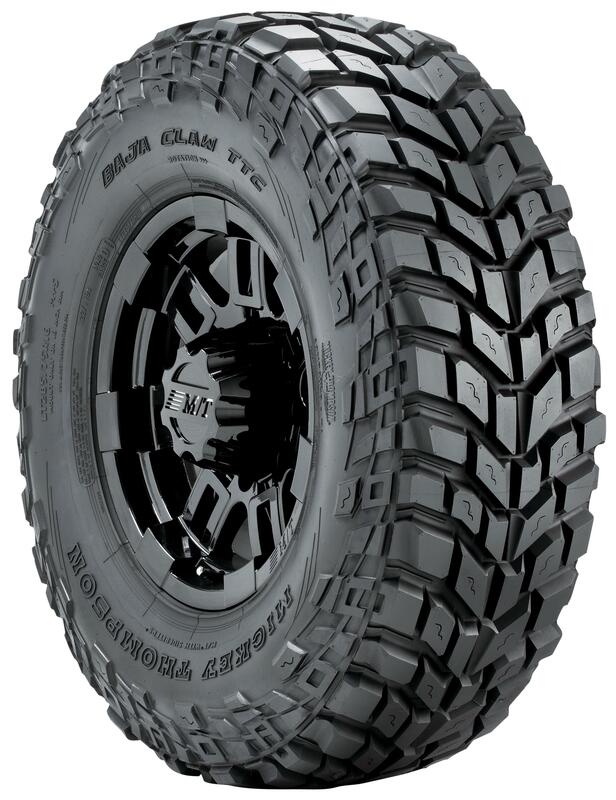 STOW, Ohio – Dec. 19, 2012 – Now available in 37X12.50R17LT size, the Baja Claw TTC Radial from Mickey Thompson is the ultimate extremely rugged, off-road performance tire with advanced radial construction. This tire will take on tough terrain with confidence – clawing over boulders, digging through mud, tearing through gravel – and then transitions to the street with ease. Mud scoops placed strategically along the outer tread block and the directional 23-degree tread lugs, along with the extra wide footprint and decoupling grooves in the tread, allow the tire to flex and conform to irregular surfaces making it ideal for rock crawling and challenging terrain. For enhanced puncture resistance and better handling, the Baja Claw TTC Radial has a reinforced three-ply PowerPly™ sidewall. For more information, visithttp://www.mickeythompsontires.com/truck.php?item=BajaClawTTCRadial.